A properly ventilated stable is extremely important for the health and well-being of your horse. A properly ventilated stable will make all the difference to your horse’s happiness and health. Fortunately, here at Prime Stables, we are aware of the importance of stable ventilation which is why we build and install horse stables that are properly ventilated. Your horse stable should smell of fresh forage and clean horses, rather than manure and dust. So, how do you ventilate your barn effectively? The objective of ventilation is to provide fresh air into a space. In regards to stable ventilation, the objective is to provide fresh air for your horse by providing sufficient openings such as vents, doors, or windows in your stable. Effective ventilation is needed to remove heat, dust spores, and stagnant air from your stables. It is common for horse stables to have significantly more moisture being added to the air, in addition to odours and mould, than any other building. Therefore, ventilation could not be more valuable. A stable that is not ventilated properly can have numerous effects on your horse’s health, even causing heaves in horses! By improving your barn ventilation, you will be one step closer to providing a healthier environment for your horse and stable workers. Proper ventilation in stables is crucial to horse health and will minimise your horse’s exposure to dust spores, mould, manure odours and other environmental irritants. This will significantly reduce the likelihood of respiratory diseases in both horses and people. Simply put, ventilation in the stable is most effective when the stable has been designed with proper ventilation in mind. The main objective of any stable should be to get ride of stale air and get fresh air to the horse. Good ventilation is important in all horse stables and at Prime Stables we design and build well-ventilated stables that are ideal for your horse. Discover our full range of stables here for more information. Installing stall vents in your stable can significantly increase effective stable ventilation and air flow within your horse stalls, where air is typically stagnant. Stall vents are an effective and discreet method of improving ventilation in the stable environment. Rather than causing drafts, they simply ventilate the stall area and allow a circulation of fresh air for your horse to enjoy. Having doors in your stable is extremely important. Not only does it allow for easy access, it also allows for maximum air circulation, keeping your stable filled with fresh air on a daily basis. Having doors either end of your stable is extremely beneficial during the cold season as it removes any hot, stagnant air and controls the foul odours. 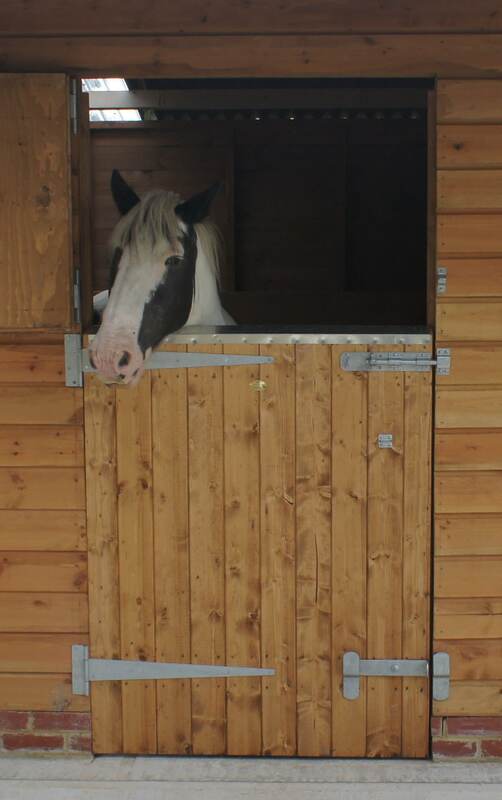 Aim to open your stable doors at least once a day to ensure effective ventilation and maximum fresh air for your horse. The stable bedding you choose for your horse can have a significant effect on your horse’s health and his need for proper ventilation. Hay bedding is one of the major sources of mould spores and particles in the barn air. Additionally, as the hay becomes wet with urine or manure, it can mould. Not only does this cause your stable to fill with unpleasant smells, but it also has a significant effect on your horse’s health. Improve the ventilation of your stable by choosing a bedding option that does not create a dusty environment, such as rubber matting. Rubber matting is an extremely popular bedding option for many horse owners as it saves on the cost of alternative bedding choices, it is easy to clean, and it does not create a dusty environment. To find out more about rubber matting, click here. To ensure a stable environment that is pleasant, clean and dry for your horse, muck out the stalls daily. Regularly mucking out can reduce the build-up of mould, dust, and other air pollutants (such as ammonia fumes), that can be harmful to your horse’s health. Mucking out can also increase the ventilation of fresh air in the stable environment as it rids stalls of manure and mess that can cause unpleasant smells. Keeping your stables clean provides a much pleasanter environment for your horse and increases the ventilation of fresh air into your stables. Depending on your stable, you may be able to improve the ventilation by using a motorised fan system. Although natural ventilation is adequate for housing horses, motorised fan systems are an option. Mechanical fan systems are effective for areas of the stable where direct access to fresh air is particularly difficult. Alternatively, some stable owners use ceiling fans to draw air up from the stable and out of the roof vents. Motorised fans are very effective and are popular amongst many horse owners. However, they are not a necessity, and often natural ventilation will do the job. There is nothing more important than a well-ventilated stable for the health of your horse. So, if you haven’t already, it’s time to start thinking about effective stable ventilation and how to let more fresh air in. I hope my suggestions have been helpful. If you have any questions for me, please do not hesitate to get in touch today! For more information about stables and horse health, you should definitely read my article about the importance of a stable for your horse, which you can find here.